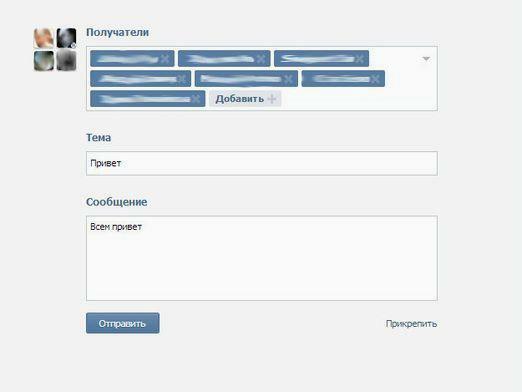 In "Vkontakte" social network can communicate, friends and lead a band of interest. Here people organize polls, preparing for meetings and just spend their free time, communicating with interesting people. But often beginners do not know, how to send a message to the contact. therefore, having got your account VKontakte, please read our article, to avoid problems with sending messages. For the novice user's contacts will be useful to know about the possibility of collective postings. This can be useful, eg, when a person wants to congratulate all on one holiday, or invite friends to your celebration. To send a message to all your friends you need to go to the tab "My Messages". Before the user opens a window with a field for the text and the address bar, where with the help of "Beneficiary" button to make all friends. choosing friends, which it planned to send a single message, We need to remember, that the collective distribution is carried out only on the 14 address. If the number of friends you have more, will have to send a message several times 14 addresses. Be sure to enter the text in the message before sending. And click on the "Submit" button. Posts refresh the page, Show the last result and sending text messages. If earlier on the site existed "Opinion" section of "In Touch", where each user the Internet could leave a review, without revealing his name, today this section was removed from public access. But in the software social network path to the preserved. To leave an anonymous message, using the section "Opinion", We need to find a way for him. We introduce a direct link in the browser section on http://vk.com/opinions.php and find ourselves in the right window. It must be remembered, that link does not always work. Users are often redirected to the new Contacts section, thereby limiting the possibility of anonymous communication online. When you master all the wisdom of, how to send messages to the contact, you will understand, that communicate on the site was easy and pleasant.